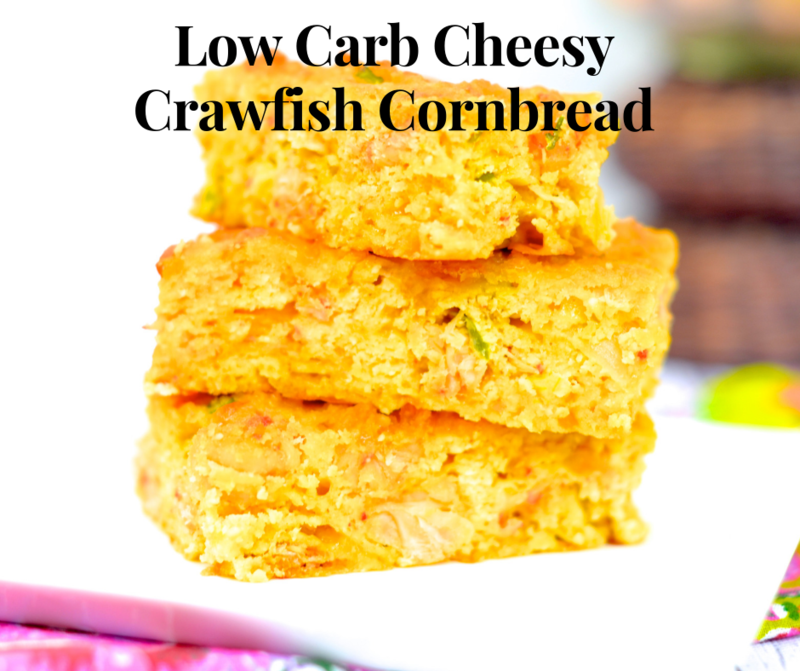 This low carb cheesy crawfish cornbread recipe is made with almond flour and contains ZERO corn, cornmeal, and taste absolutely amazing. Before scrolling down to the recipe, be sure to read my easy tips for making your recipes low carb, keto friendly, and delicious. QUESTION TIME: When and where were you when you had your first bite of cornbread? I can vividly remember waking up on Sunday mornings to my cup of Community coffee (yes, I drank coffee when I was in diapers), biscuits, and cornbread. The warmth, the taste, and little did I know, the carbs. The love of cornbread is something Mr. Skinny Louisiana and I both share. He too, experienced the love of cornbread, not over coffee, but at his grandparents home. 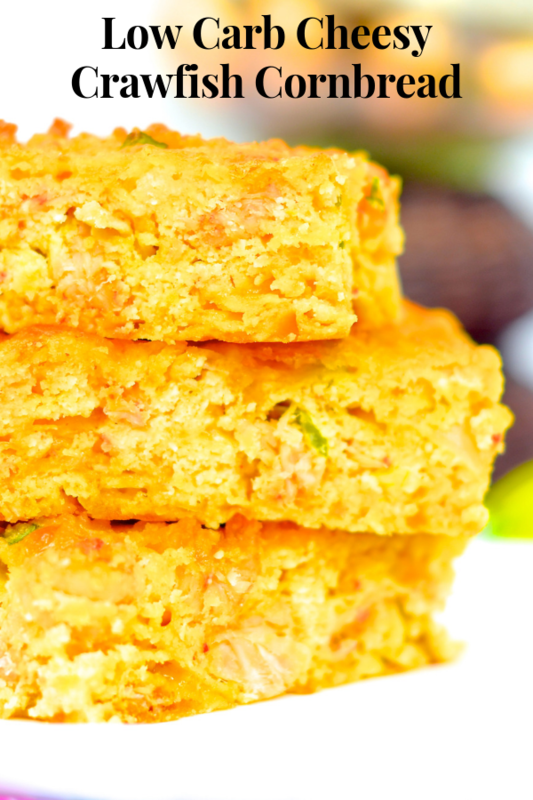 Cornbread is a wonderful, versatile dish. It can be served alone, as a dessert, with a meal, for breakfast, lunch, and supper. It’s serve with chili and for breakfast. It’s cooked plain or with various meats, vegetables, and spices. It was Greg who has always requested a low carb cornbread, and of course I had to cajun up this dish. 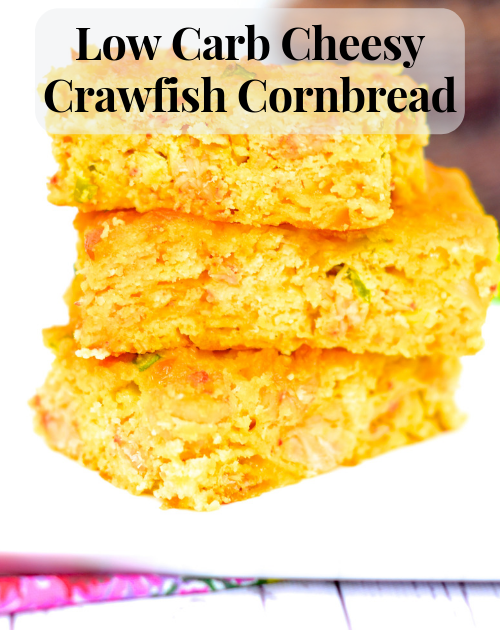 How would the combination of crawfish and cornbread sound? It was time to take to my drawing board on making a cornbread low carb with the main ingredient being cornmeal? With a little bit of this and a few moves here we have an amazing cornbread the entire family will love! Let me know if you tried the dish in our comments below! 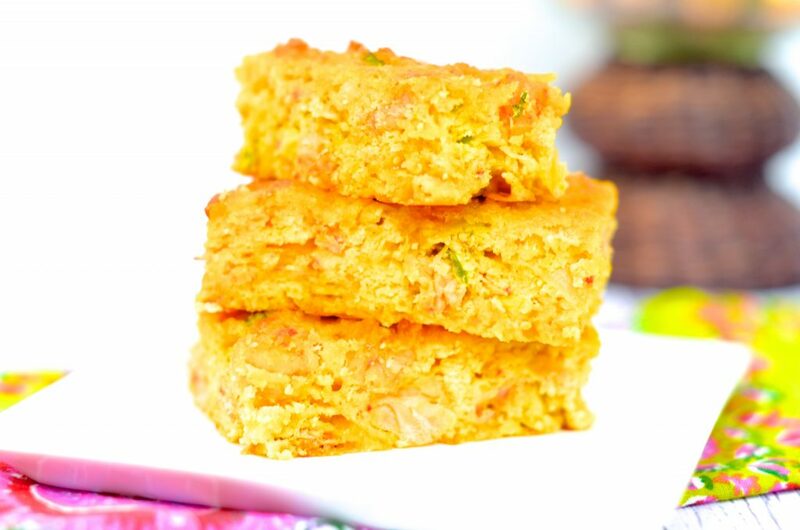 Low Carb Substitutions in our Low Carb Cheesy Crawfish Cornbread. While many of us recognize crawfish as a protein and not a high carb meat, many question ‘Is this an ok meat?’ Louisiana crawfish is an amazing source of protein with three ounces of crawfish at 0 carbs and 12 grams of protein. If you are looking to use leftover crawfish in this recipe, be ready to peel 3 pounds to yield the 1/2 pound of crawfish tails. While it is temping to look in our supermarket freezer section from crawfish tails, make sure the product is Louisiana based and not exported from China. With any cornbread, cornmeal is the basic ingredient. Cornmeal in the low carb and low net carb world makes us cringe since cornmeal has 50 grams of carbs and 4.5 grams of fiber per 1/2 cup serving. Enter almond flour! Almond flour is made of almonds that have been ground to a fine texture. It is a gluten free, keto friendly, grain free food and contains approximately 5-6 grams of carbs per 1/4 cup. Don’t panic over the carbs, almond flour has approximately 3 grams of fiber giving this flour a net carb of 3 per serving. And please don’t panic over the fat. Remember nuts are the fats we want to include in our diet. I do enjoy cooking with almond flour, but I personally feel due to it’s heavier texture, almond flour works best in bars, brownies, and muffins as well as in my batters for my vegetables and meats in the air-fryer. Almond flour makes a great low carb bread crumb when combined with grated Parmesan cheese. Please note, the type of almond flour does matter. Make sure to use super-fine almond flour from balanced almonds. We used Bob’s Mill Almond Flour in this recipe. You can purchase online here! Spray 8 x 8 pan with non-stick cooking spray. Combine almond flour, baking powder, and Tony Chachere’s lite. Place aside. Grab another bowl and your hand mixer. Combine eggs, oil, and sour cream in a small bowl. Beat with a hand mixer for 1-2 minutes. Pour egg mixture into flour mixture. Using a rubber spatula, combine ingredients. Beat with hand mixer for 1-2 minutes. Get your crawfish in there! Add onion, cheese, and crawfish to mixture. Using a rubber spatula, combine all ingredients. In a large bowl, combine almond flour, baking powder, and Tony Chachere’s lite. Place aside. In a separate smaller bowl, combine eggs, oil, and sour cream. Beat with a hand mixer for 1-2 minutes. Add crawfish, cheese, and onion to mixture. Using a rubber spatula, combine all ingredients. Bake in oven for 35-45 minutes. Calories: 100, Total fat: 7g, Saturated fat: 2g, Cholesterol: 50mg, Sodium: 115mg, Total carbs: 2g, Fiber <1g, Sugar: <1g, Protein: 7g.